The departure of experienced workers, forced to leave after reaching their radiation exposure limit has largely left a growing number of inexperienced workers and contractors who themselves are dealing with issues of radiation exposure, moral problems, and accidents… all the while facing a 40-year cleanup plan. Since the tsunami and subsequent meltdown during March 2011 and now, hundreds of employees have either reached the 100-millisievert [mSv] threshold or are near to it, meaning they have been removed, or their days at the plant are numbered. Workers who have stayed on do so in the knowledge that they risk damaging their health through prolonged exposure to radiation and in accidents. Tepco (the power company) has said that nearly 2,000 workers had estimated thyroid radiation doses in excess of 100 mSv, the level at which many physicians agree the risk of developing cancer begins to rise. These risks are taking their toll on the dwindling number of workers with any real experience. Some workers have left because of exhaustion and stress, while others have decided to find work closer to their displaced wives and children. Many of the laborers employed by subcontractors live in cheap accommodation outside of the exclusion zone around the plant and they don’t communicate much with each-other while they look after number one. “Newcomers are looked down on by their colleagues and some don’t really know how to do their jobs.” Another worker said he had seen hungover colleagues collapse with heatstroke just minutes after beginning work. “Most of their employees have no experience of working in conditions like these, and all the time their exposure to radiation is increasing,” said Naka, who runs a firm just south of Fukushima Daiichi, that provides technical assistance to Tepco. The unfolding disaster at the Fukushima Daiichi nuclear power plant has been largely unreported and ignored by the mainstream media and the world outside of Japan. While the expertise and moral of the remaining workers dwindle, as the oceans and fish around Japan are apparently aglow with radiation, and while the cores and thousands of nuclear fuel rods in and around the plant continue to present great risk to Japan and the world, we’re all too busy ignoring it rather than pushing Tepco and the government of Japan towards accepting International help to contain this disaster. The recent hurricane didn’t help much either. Tepco pumped probably tens of thousands of gallons of relatively heavily contaminated water directly in to the ocean. there is no end in sight for this debacle as the world does not have the technology to deal with several melted cores that have since penetrated the basements beneath the reactor vessels. in fact, it is currently unknown exactly where the cores are at this time, since the radiation is nearly immediately fatal in the basements of these reactors [the Torus rooms]. Every time I read about these bumbling idiots and the half-baked plans they come up with I want to scream. Exactly why this has not turned in to an international emergency so that people with the needed skills can be brought in to expedite some sort of plan to at least ameliorate the situation or try and control the water that’s accumulating faster than they can deal with it. Over the long term, this thing will poison the earth. The whole “saving face” culture in Japan will be their undoing. Already, many athletes have stated they will not go to Tokyo because of the radiation concerns. The Japanese government should spend those billions on Fukushima instead of trying to build up some sort of Potemkin venue to impress the world. They’ve got bigger problems than any country has ever seen before, yet they continue to allow a bankrupt and unqualified group of private corporate idiots continue to make decisions that will affect the rest of the planet for 24,000 years. It is because of what has gone on in Japan that I have decided to stop eating seafood of any kind. I think pretty much anything coming out of the Pacific Ocean will likely be contaminated. makes me wonder if the odd fish/creatures NEVER seen before washing up /coming close to shore aren’t being driven by the radioactivity in the ocean… was on news friday i believe. Japan = Dead Men Walking. @Ken! Thank You so much for this post! I humbly ask, is it possible that you can keep this issue in the forefront somehow? I also avoid seafood from the Pacific. @All; check out : K14u web site,and Cresson h. Kearneys free e-book; “nuclear war survival skills”, check into protection for your thyroid! Learn how to make an expedient fallout shelter! Cheers! i too would appreciate if you could keep us up to date. seems we arent going to find out any other way. I had no idea that this was so out of hand. I assumed the cooling efforts had prevented a total melt. If the mass has already melted thru containment, and now exists below the reactor structure, it has become a nuclear volcano, which will try to burn its way to the Earth’s core. If this has happened, and the goal isn’t to just cover and prevent the melt’s exhaust from escape, the only way to mitigate it would be to blow it up. A melt is most dangerous as a collected mass. The idea would be to “scatter” the melt over a broad area, where each scattered component would become cooler and stop the boring action of the unified melt. The bits could then be collected. This was the plan for U.S. melts in the 70’s. Along with using mining equipment to get under the melt, create a large cavern, and “catch” the melt as it arrived, using the underground space to scatter the melt components. The people performing these tasks would basically be sacrificing themselves for the common good. And we viewed this danger, as a soldier might, when facing almost certain death when ordered to charge a strong enemy position. I was a member of such a response team, when Three-Mile happened. The Russians had such teams too. You might remember those disturbing images of a Russian team working until they died at Chernobyl. Every radioactive isotope spews from these uncontrolled melts and, if allowed to vent directly to the air, permanently contaminates the area over which it falls. The only plan then, was to literally scrape 4″ of earth up, seal it in containers, and bury it. We also planned to gas the area to kill any life, which might migrate out of the contaminated zone. But, even we thought this plan was just something put on paper to fill a file. I just knew we were all screwed the moment I saw the hydrogen explosions. check out ENE News, EXSKF or Fukushima Diary. These brave bloggers have been harassed, intimidated and even jailed for telling the truth about the unmitigated disaster and the clownish efforts put forth to date in a weak effort to attempt to contain THREE melt-through events. The lame-stream media has ignored this from about week two, most likely at the behest of their puppet master BHO. ENE news uses reports from some alarmists and crackpots like Gundersen and fruitcake Helen Caldicott. In between the nonsense is a some good stuff though. Unfortunately the blog just regurgitates the same old problems each time with a different slant. The blog commenters are 99% nuclear illiterates and just belch wild theories. The underlying problem is that Fukashima IS a catastrophe. It’s not going to go away and will eventually turn into a major, major problem. Certainly for the Japanese. Probably a black swan event for the rest of us. While I wholeheartedly agree, I still say it’s a good resource for current pictures and some first hand stuff here and there. This is harsh and I know it. And it will not happen! But the only thing I can think of to help stop this extremely dangerous issue, and even then it may not work, is to explode a very small sized nuclear bomb on/ in the 4 reactors, and burn everything all up???? Or would/ could it make things as bad or worse? Now we have…Slow constant leaks… In atmosphere and into ocean…… For the next few centuries? And god forbid we get a major meltdown! To dangerous for humans to even enter area? Note: it would NOT be an above ground/ atmospheric detonation.There is no way the Japanese people would let that happen? Otherwise, and anyway, why is there no international fund, ( like for other disasters), for the common people like us to contribute $ to fight this prob???? And why aren’t worldwide governments/U.N. , not throwing trillions, and committing top scientists to it? How bad is it really? How bad could it get? What can we do besides plan/ prepare with civil defense? I have read that it could make the entire northern hemisphere unliveable! I don’t know why but I think something stinks, and wow….. There are plans to build even more damn reactors all over the world! Dang it! Why are most all the governments not following ths Swiss civil defense type plan? Centuries. There are MOX fuels at Fuku. Try halflifes of 200,000 to 15 million years for the plutonium and uranium. The Russians were very proficient with their Bombs from almost the start. Their bombs burn up nearly all the fissionable material. The US bombs were not so good. The Bombs dropped on Japan in 1945 were technical failures and only around 10% or less of the fissionable material was utilized. (You can imagine the damage if the bombs had been 100% efficient). The largest atomic test ever made by the U.S. (Castle Bravo) was an accident. The yield was far greater than the calculations. The U.S. government had to pay the medical expenses and relocation expenses of many Pacific islanders who were effected by radioactive pollution and fallout caused by this “accident”. Modern U.S. bombs are now “clean” (If you can call a nuclear device clean). I shudder to think of North Korean designs. The fuel material at Fukashima is not weapons grade. A bomb would need to be devised to fission of all the available fuel on site. It’s a technical problem – not unsolvable. You have to get this news on the “E” Network for half the population of the USA to find out. For most of the rest show it on “TLC.” Wonder if Honey Boo Boo knows? The lack of msm coverage on this on going saga has really blown my mind! You can’t rely on the nightly news to inform you of world events. People really need to wake the hell up!! I too quit eating seafood from the Pacific after this event. enenews.com is a good place for constant updates. One of the big stations (abc, cbs, etc. )is owned by British Nuclear Fuels. Wikipedia I think probably has data. 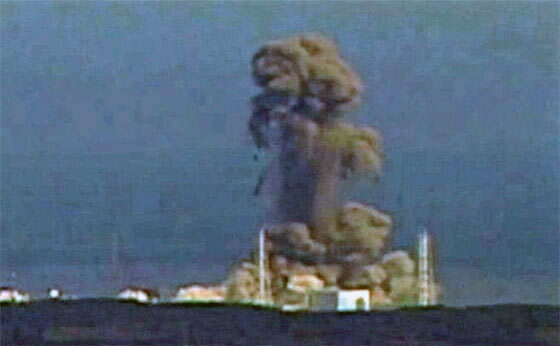 The only solution is more controlled radiation release – nuke the plant to burn up and destroy all the rods! ModernSurvivalBlog.com participates in the Amazon Services LLC Associates Program, earning advertising fees by linking to Amazon.com (at no extra cost to you). Thank you for helping compensate for my efforts.